Seville, Grenada, Cordoba, Cadiz - just the very mention of these quintessential Andalucian cities conjoures images of what most people imagine the "real" Spain to be like. White washed villages, colourful fiestas and festivals, sensuous flamenco, Moorish places, tapas, sherry from Jerez. But theres more to Andalucia than just the imsges portrayed on so many travel posters. There are also the hidden gems and Travel One's gem is Nerja, one of Andalucia's prettiest coastal resorts, located some 40 miles east of Malaga. Her, with a backdrop of beautiful mountains scenery you would be forgiven for thinkingyou are a million miles from the bright lights of the Costa del Sol. The pace is slower, there's a selection of attractive rooftop bars with great views, pretty little whitewashed houses with colourful flowers and plants, and always a friendly "buenos dias" from your Andalucian hosts. The Perla Marina comprises of two buildings and overlooks one of Nerja's three beaches. There's the main pool (with complimnetary towels, deposit payable), a rooftop pool (seasonal openings) with loveley views of Nerja and it's mountain backdrop, sun terrace, restaurant, bar, snack bar, a reading room and ganes room and occasional live entertainment. All the Perla Marina's comfortable, air-conditioned bedrooms have a satelite T.V., phone, safe (payable locally), bath/sh/wc and hairdryer.some rooms have a balcony/terrave. Sea view rooms, all with balcony or terrace are also available (£14 per day supplement). 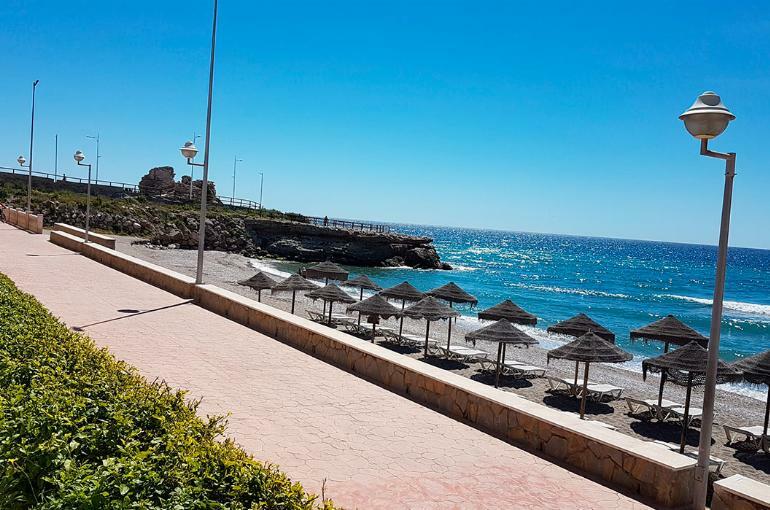 The famous Balcon de Europa (a lovely pedestrianised area overlooking the sea) and the centre of Nerja, with a wide selection of shops, bars and restaurants, are just a 10 minute stroll from the Perla Marina.